This is where you can find out how to get an account so you can post on these forums. I do not allow automatic user registration on these forums thanks to people who like to use my site for their own spam and advertising purposes. If you are one of these people I hope you die a slow and painful death. In fact it would amuse me greatly if you find the nearest interstate highway and see how many times you can run across it before getting run over. 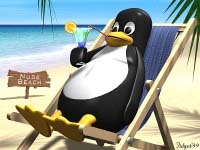 On the other hand, I gladly and openly welcome any new users to these forums who share my passion for Linux and the GPL and wish to contribute in some way to the community (whether that be the giving or receiving of Linux help). There is no fee to register and I request no donations. All you have to do to register is register your account via the registration link on the upper right hand corner of this page. Then send me an email with a short sentence about why you would like to join and the username that you picked on registering. This sentence should probably say something like "I want to join because I would like help with something Linux related" or "I want to join because I want to help someone on your forum with something Linux related". I will then activate your account. Please do not ask for help in an email to me. I will not answer such requests. The forum is the proper place to ask for help. Likewise, the guest book is not the proper place to ask for help. I will not answer help requests unless you have a forum account and post your question on the forum. Everyone benefits this way. Free speech is not an option on this forum. The administrator (Void Main) wishes to keep this a clean forum (G rated) and for it to stick to the subject of Free Linux as closely as possible. It is also forbidden by Void Main to discuss or link to political or religious content. Void Main reserves the right to ban any content he wishes and delete content that he does not agree with (and to be fair, delete it even if he agrees with it). Yes, Void Main carries a big censor stick. If you do not agree with this then do not join. You agree not to post any abusive, obscene, vulgar, slanderous, hateful, threatening, sexually-oriented, drug related or any other material that may violate any applicable laws. This also means no swearing. Doing so may lead to you being immediately and permanently banned (and your service provider being informed). The IP address of all posts is recorded to aid in enforcing these conditions. You agree that the webmaster, administrator and moderators of this forum have the right to remove, edit, move or close any topic at any time should they see fit. As a user you agree to any information you have entered above being stored in a database. While this information will not be disclosed to any third party without your consent the webmaster, administrator and moderators cannot be held responsible for any hacking attempt that may lead to the data being compromised. Thank you! I look forward to communicating with you on these forums! EDIT: If you send me an email requesting membership and do not get a response from me within a day send another message. More than likely I just overlooked the request or I accidentally deleted it or perhaps I pulled some other bone head move. At any rate if you send me a request I will not intentionally not respond.